Welcome to Day Seven of The Escapist's Indie Developer Showcase, a 10-day celebration of the designers and programmers who have struck out on their own to make the games they want to make. Each day we'll feature a new game or demo by an up-and-coming indie developer along with a brief interview. Some games are already commercially available, some are works in progress, but all are free to play. To see who's on the schedule or check out what you've missed, click here. Enjoy! Gabe Jones is Chronic Logic, developer of the strategic board game Zatikon. After his first taste of gaming on his older brother's Atari 2600, Jones knew he wanted to make games. During the 1990s he discovered MUDs, made his own, and has been making online games ever since. "Zatikon is the board game I always wanted to play. The diversity and customization of collectible card games merges with the deep tactics of a strategic board game. 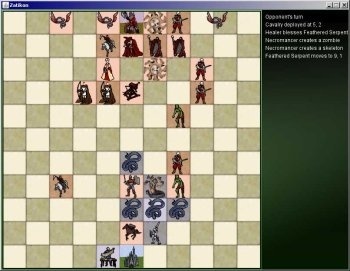 It's played on a plain checkerboard, but your army is chosen from a large selection of fantasy RPG characters with very distinct special abilities that go way beyond simple numeric statistics. The goal is simple: to move one of your units on your enemy's castle square. But your enemy has the same goal, and the action occurs as the two armies slaughter each other along the way." "The most difficult part is staying motivated. Programming a game by yourself is a lot of fun, for about two weeks. Then it becomes work, but the kind you're not necessarily being paid to do. Burnout will inevitably set in, and you must wage an internal war to keep taking each tiny step forward. "But you can get anywhere if you just keep taking steps long enough, and the reward of seeing people enjoy your game is worth all the hardship." "Big budget games often dilute those mysterious, elusive qualities that produce exciting gameplay with an abundance of features and content. They're superior as an immersive storytelling medium, but dynamics excite me and small games express them so purely." "There's only so much time I can invest in a day. If the Game Developer Fairy granted me my wish, I'd be working with a team of four, making games with 2-3 man years of labor." "Team Fortress 2 and Warcraft 3: Defense of the Ancients conspired to steal more than their due share of my time. TF2 is elegant, polished and way too much fun. But DoTA still manages to be the most satisfying way to pwn some noobs and rejoice in my sad, wretched triumph." "I'm a nerd to the core, and harbor a deep love of science and history. Games are just an outlet for my underlying fascination with systems."